A4 play spoiler for Death By Elbow, picking up the win in a long and exciting opener. A4 were excellent babyfaces. We started off with the closest you will ever see to RingKampf being involved in a dance-off... but it was all a ruse because that WALTER truly is a ring general. RingKampf pick up the win, so they'll win Block A unless JML defeats Moustache Mountain later. CHRISTIAN MICHAEL JAKOBI PROMO - He buries other German promotions as being not as good as wXw, and also insults Karsten Beck. The fans don't like this. He calls out Da Mack and offers him the choice to join RingKampf but Da Mack turns him down, saying he will fight for everyone- including many people in wXw- who think Jakobi is a jerk. Fun. JML win, and thus win their block. THE ALPHA LOVERS MARRY - This was an AMAZING segment. The wedding was very basic, with just the ring announcers, bride, groom, and the fans, so that, plus the fact that it's a pro wrestling wedding, should have told you that this wouldn't go well. As our lovely bride Melanie Gray made her way down the aisle, Alpha Female attacked her from behind. Alpha Kevin rushed from the ring to make the save but was felled by a shot to the head with the crutch of his former tag team partner Marius van Beethoven. More stuff happened, and the babyfaces got destroyed. Aside from a quick burst of forearms on Alpha Female by Melanie, and Kevin getting some offense on Marius (who is injured after all) when Marius tried to hit Kevin with his own finisher, the babyfaces got nothing here, which was the way it should be. It is rare that I have ever hated heels more than I did in while watching this. The actions of these pieces of subhuman scum that are Marius van Beethoven and Alpha Female are completely unforgivable, and these bastards MUST be made to pay. These assholes make even f*cking Jinny look like a respectful and moral Girl Scout, and please keep in mind that Jinny is someone whose behavior regularly prompts an entire room full of people to sing at her that she is a C. After watching this segment I was ready to fly to Germany and follow wXw around and hold rallies before every show where Marius and Alpha Female would be burned in effigy. I would have traded my entire comic book collection for voodoo dolls of these two. I HATED THEIR F*CKING GUTS. That being said... I'm having a hard time remember a segment that was this good while the shooting of it was this bad. I'm not blaming the camera crew because they didn't know exactly what the wrestlers were going to do, but I shouldn't have to see a chokeslam off the ramp in the background because you've cut to the ring to look at something else. Did Melanie take a bump to the floor? Did she land on fans? Go through the merch table? I have no idea. I just know she fell and then disappeared for a while. And the shots of Alpha Female "banging Melanie's head against the ramp" were so tight in that it was very obvious that Alpha Female was actually doing nothing of the sort. I get that this happens by accident sometimes (I don't mean protecting your opponent; that should always happen. I mean the camera exposing it), but if you're the cameraperson and you notice this happening then ZOOM OUT! Anyway, Marius spits on the fallen Kevin, then spits on some part of Melanie's dress that Alpha Female ripped off, then the leaves leave in triumph. Melanie crawls into the ring and she and Kevin crawl towards each other and hug. POST-MATCH SEGMENT - RingKampf assaulted both men after the match. A bunch of security guys and also A4 came out to make the save. An appropriately epic conclusion to this tournament (although I could have done without the little swerve with Zack). 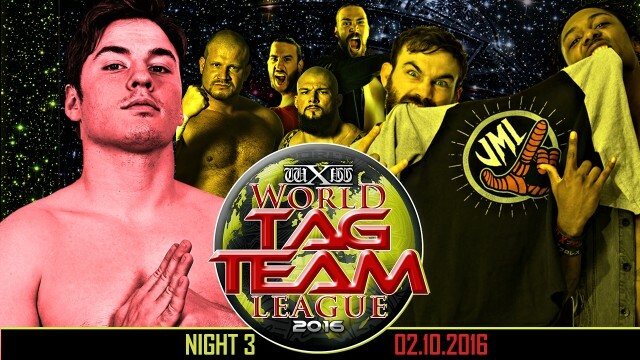 An awesome show from wXw, and one that is truly must-see due to both the action, the importance of the tournament, and the other major storyline developments. GO WATCH IT NOW!